While there’s no wrong time for studying Torah, an argument can be made that now is an especially good time, with a stretch between major Jewish holidays and winter in full swing in much of the world. For those not involved, Chabad has always been a central place to get started. It is the movement’s raison d’être—the core initiative of the Rebbe, Rabbi Menachem M. Schneerson, of righteous memory. For those already involved, it has served as a way to get in touch not only with their Judaism, but with themselves, their professions and other people. 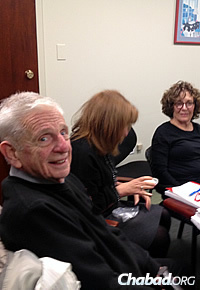 Take, for example, Robin Lowey, a 60-something Philadelphia psychologist. She was still mourning the loss of her father when she got a flier in the mail advertising a six-week lunchtime course focusing on the Jewish view of death and dying. Somewhere deep down, Lowey was seeking to connect with Jewish learning and observance; she spends all day talking to patients and says she can’t muster the mental energy to study at night. But this series of classes—taught by Rabbi Yochonon Goldman, leader of Historic Congregation B’nai Abraham and director of adult education at Lubavitch of Center City—met at a law office right down the street from her own. Lowey went and checked it out. Now, some two years later, she find herself signing up for every lunch-and-learn he runs. Across the country, busy professionals like Lowey are taking a break in their days, gathering in small groups and engaging in Jewish study. In many ways, the idea of people flocking to lunchtime classes in person is counterintuitive; after all, contemporary society values people working through lunch, checking their email via phone or tablet while shoving down enough fuel to get back to their desks and pick up where they left off. That is, if they leave their desks at all. There’s the added fact that engaging with Judaism online is easier than ever. Indeed, Chabad—through its web site and multimedia outlets—has been a pioneer in making all kinds of Jewish content available at the touch of a button. Still, students and rabbis note that many benefits—personal connections, an intimacy, the chance to hash matters out with others—come from a physical classroom that just cannot be experienced virtually. Goldman’s themed lunchtime courses typically run once a week for six weeks, and are designed by Chabad’s Rohr Jewish Learning Institute (JLI), headquartered in Brooklyn, N.Y. Participants typically bring a bagged lunch to the 90-minute class. In fact, Philadelphia was one of the original places where such one-on-one study took place for busy professionals. Back in the 1970s, Rabbi Abraham Shemtov—regional director of Chabad-Lubavitch in Philadelphia and chairman of Agudas Chassidei Chabad, the umbrella organization of the Chabad-Lubavitch movement—jump-started learning with individuals in America’s fifth-largest city, which was filled with attorneys and accountants. Rabbis in other urban centers did the same. Over the years, the idea took on momentum. In 1985, the Rebbe launched a vigorous campaign to “institute Torah study classes throughout all facets of modern society,” including the growing suburbs where Jewish families and individuals were moving, and in the workplace. By the 1990s, lunchtime learning, as well as at other times during the workday, was taking places at thousands of offices around the country, spearheaded by Chabad rabbis and rabbinical students. The objective was to introduce or reinforce classical texts like the Chumash (five books of Moses), Talmud and Mishnah to Jews in their work environments, where many spent just as much time as they did at home during the week. Chassidic history and thought accompanied the lessons. 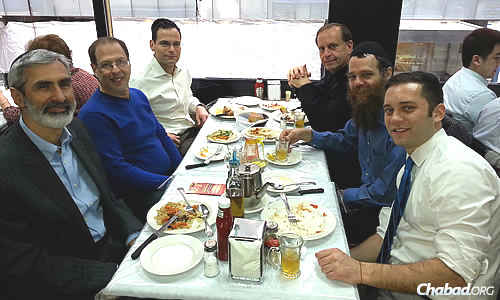 For the last seven years, Rabbi Chayim B. Alevsky, co-director of family and youth programs at Chabad of the West Side in New York City, has run weekly Torah lunches at a kosher restaurant in Midtown Manhattan. He points out a requirement in Jewish law to study Torah twice a day, and it is taught that Jews should study Torah whenever they have free time. Offering a class in the middle of the day, he says, was also a way to help fulfill a mitzvah. New York City features the largest number of midday Torah-study classes run by Chabad, and has for decades. The group at Cafe K, where class was held for the first five years. Laurent Morali, who initiated the lunch-and-learn sessions, is seated at top left. Serge Zenin, a 28-year-old lawyer, was born in Moscow and raised in Brooklyn. Growing up, he says that he encountered virtually no Judaism in the home, and that the yeshivah he attended for a time left him feeling distant. Yet in 2012, when he was living on the Upper West Side, a friend invited him to Chabad of the West Side for Shabbat services. 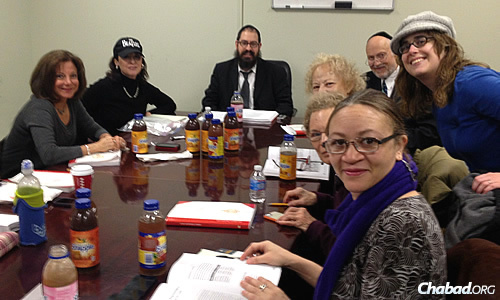 Then he found out that the rabbi’s lunch-and-learn class happened to meet down the street from Zenin’s law firm. Before long, Zenin was attending virtually every week. For two years, he would study the Torah portion in advance and then go to class. He also encouraged friends and co-workers to attend. Now, he makes a point of having Shabbat dinner with his mother and grandparents in Brooklyn nearly every week. He also wound up hanging mezuzahs on all of the doorways in his father’s New Jersey home, as well as fix one that was hanging upside-down. The group at Taam-Tov, where class has been held for the past two years. Russ W. is seated at the top right, and Serge Zenin is seated at bottom right, both next to Alevsky. Russ W., a 50-something father of three, first met Alevsky through his now 15-year-old son, who struggles with Attention Deficit Disorder. The boy was having trouble preparing for his bar mitzvah and connecting with a teacher; he ended up working with Alevsky. Needless to say, all turned out well, and the rabbi asked Russ if he’d like to drop by a lunch-and-learn. 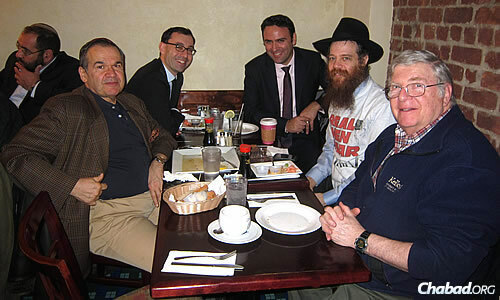 Russ, who identifies as Modern Orthodox, works just a few blocks from the restaurant and ended up going. Now, he drops in to classes two to three times a month. “They are more classes about life, rather than specific topics like Talmud or something,” says Spivack, who often hosts the classes at his Center City office. Lowey, the psychologist, says she had never felt truly connected to Jewish sources or practices until she began attending the lunch-and-learn sessions. She lived in Israel from 1974-81, but says she engaged in almost nothing religiously while there. 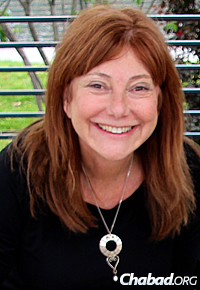 Engaging in Jewish study, she feels, has also made her a better counselor to her patients.